Giovanni's secretary is a recurring character in the Pokémon anime, making her debut appearance in Memories are Made of Bliss!. In her debut, she sent a message with Delibird to recruit Jessie, James, and Meowth to be part of the as-yet-unknown "Project Den" on direct orders from Giovanni. 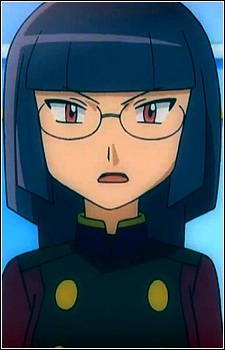 She has then appeared in several Best Wishes series episodes to date often by Giovanni's side, giving orders to the Team Rocket Trio. In BW025, after the events in Castelia City, she temporarily dismisses Jessie, James and Meowth to act on their own in Unova. Her name was spoken by Meowth in the original Japanese version, as well as Chinese and Indonesian dub of Battling For The Love of Bug-Types!. However, she does not have a proper name in the English dub, and the line revealing her name is edited.